Open the Users tool from the Main Menu and select the user's User ID. Open the Enrollments screen and select the Enrollment ID that you want to change. Open the vertical menu in the toolbar and select Move Enrollment. Enter the new course name or ID in the Move this enrollment to course field. When moving a student between courses that are copied from the same Master Course (even with a Static Copy), submission and grading information remains intact for all activities with matching activity IDs. Blog, Discussion, Journal, and Wiki submission content isn't automatically transferred even with matching activity IDs. 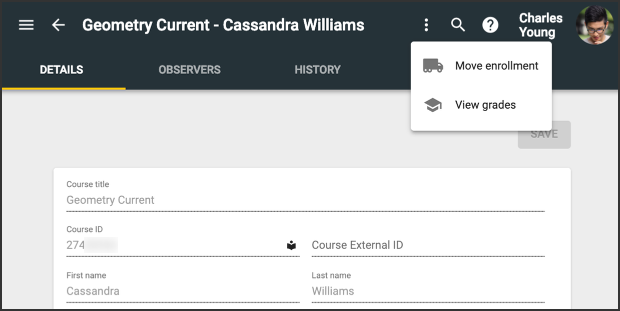 When moving a student between courses with non-matching activity IDs, the teacher of the original course can export gradebook information for the new course's teacher. Will the Move Enrollment option work properly as long as one of the masters in the chaining is the same? For instance, if a student moves to a school in a new district, can we move their enrollment as long as one of the masters within the chain is the same? In other words, the direct (father) master of the course wouldn't be the same, but the "grandfather" master is. You can move any enrollment from any course to any other course. The students grades and submissions will only appear in the new course if the two courses have activities with the same IDs. Most likely, this would only happen if both of the courses derived from the same course or from each other. The two courses do not have to have the same master, but could have been a static copy. Yes. Thank you for your response, Brad!